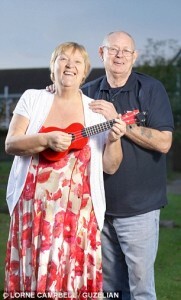 Lose 4st on The Ukulele Diet! Take that headline with a massive dollop of salt! The lady featured in this report undertook a Slimming World diet and decided on the ukulele as a side hobby, learning a total of 1 song. We fully support the ukulele playing, but we’d add syllabus with a LOT more than just one song, and perhaps not use the instrument as a meal replacement programme! We are not qualified in that area, so always consult a qualified nutritionist before undertaking any kind of diet. Dorothy Rogan lost 4st by playing on her ukulele every time she feels hungry… but her one song portfolio is driving her husband mad! 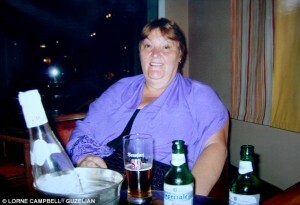 A pensioner has been quite literally strumming the pounds away thanks to her unique method of dieting. Dorothy Rogan, from Darlington, has helped herself lose 4st by picking up her ukulele to stave off temptation by playing ‘Oh My Darling Clementine’. The 64-year-old plays the American folk classic, which is associated with the cartoon character Huckleberry Hound, on repeat to avoid boredom and turning to snacks. ‘I must have played that song over a million times,’ said Mrs Rogan. ‘It is the only one I know and I just play it over and over again when I am bored. I don’t ever crave food but when I am bored, I just seemed to eat. Playing the ukulele has really defeated the boredom but it has driven my husband to despair. Dorothy Rogan before the ukulele diet! ‘I even continue playing it when it out of tune and it sounds absolutely dreadful. John will just come in and look at me and shake his head. We all call him ‘Poor John’ now’. 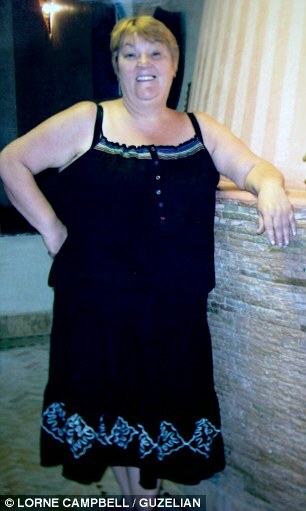 Mrs Rogan, who decided to lose weight after undergoing a quadruple heart bypass last year, has managed to drop from 18st 7lb to under 14st and intends to keep losing the pounds. In an effort to relieve her husband’s suffering she is now practising ‘He’s Got the Whole World in his Hands’ and a festive favourite for the Christmas period in ‘Jingle Bells’. Dorothy combined her ukulele playing with going to Slimming World in order to lose the pounds. Mrs Rogan said: ‘I went to Slimming World and it’s been excellent for me. It showed me how to eat properly and showed me an easy way to live my life. Mrs Rogan’s is now enjoying the benefits of a healthy lifestyle, having dropped three dress sizes. She credits her ukulele playing with her weight loss sucess, as well as making small changes such as swapping double cream for natural yoghurt and using spray-oil instead of olive oil. ‘I used to use lots of oil and cream and butter in my cooking, now I’ve changed how I cook totally. I don’t add any sugar to anything either. It’s basically a low fat, healthy diet. ‘As well as losing weight, I have dropped three dress sizes and have a lot more energy these days. I even make my meals from scratch, even the sauces and they are all even tastier than before.’ Mrs Rogan learned the ukulele at classes run by Age UK Darlington, who she also volunteers for. She added: ‘Age UK is a fantastic organisation who do great work with older people. You have never seen so many 80 to 90-year-old’s using computers, on the internet and even playing the ukulele like me. ‘Life does not stop in your 50s and 60s. That is why it is great to have such activities put on for people to learn. Dorothy Rogan with her husband John. This article could only have been written for Mailonline. By Katy Winter. The reality is, this lady completed a diet, lost weight and learnt a song on the ukulele. We support the ukulele playing, and especially so for people who have never learned to play anything in their lives before. It’s a blast. “Music self-made, is happiness self-played”. We’d love to help her learn more songs. As she’s not in London, maybe she could check out our YouTube channel could or, come down and join us at a course. https://www.learntouke.co.uk/wp-content/uploads/2014/11/Ukulele-Food.jpg 2048 3072 Lorraine Bow https://www.learntouke.co.uk/wp-content/uploads/2015/10/email-uke-logo1-300x180.jpg Lorraine Bow2014-11-11 17:00:092014-11-12 17:01:44Lose 4st on The Ukulele Diet! And read the transcript here: Did you know that every time musicians pick up their instruments there are fireworks going off all over their brain?On the outside they may look calm and focused, reading the music in making the precise and practiced movements required, but inside their brains there’s a party going on! How do we know this? Well in the last few decades, neuroscientists have made enormous breakthroughs in understanding how our brains work by monitoring them in real time, with instruments like an FMRI and PET scanners. When people are hooked up to these machines, tasks such as reading or doing math problems each have corresponding areas of the brain, where activity can be observed. But when researchers got the participants to listen to music they saw fireworks. Multiple areas of their brains were lighting up at once as they processed the sound, took it apart to understand elements like melody and rhythm, and then put it all back together into unified musical experience. And our brains do all this work in the split-second between when we first hear the music and when our foot starts to tap along. But when scientists turned from observing the brains of music listeners to those of musicians, the little backyard fireworks became a Jubilee! It turns out that while listening to music engages the brain in some pretty interesting activities, playing music is your brains equivalent of a full body workout. The neuroscientists saw multiple areas of the brain light up, simultaneously processing different information in intricate, interrelated and astonishingly fast sequences. But what is it about making music that sets the brain alight? The research is still fairly new but neuroscientists have a pretty good idea. Playing a musical instrument engages practically every area of the brain at once, especially the visual, auditory and motor cortices. And as with any other workout, disciplined structured practice in playing music strengthens those brain functions, allowing us to apply that strength to other activities. The most obvious difference between listening to music and playing it, is that the latter requires fine motor skills, which are controlled in both hemispheres of the brain. It also combines the linguistic and mathematical precision in which the left hemisphere is more involved with the novel and creative content that the right excels in. For these reasons playing music has been found to increase the volume and activity in the brains corpus callosum, the bridge between the two hemispheres, allowing messages to get across the brain faster and through more diverse routes. This may allow musicians to solve problems more effectively and creatively in both academic and social settings. Because making music also involves crafting and understanding it’s emotional content and message, musicians often have higher levels of executive function. A category of interlinked tasks that includes planning, strategizing and attention to detail, and requires simultaneous analysis of both cognitive and emotional aspects. This ability also has an impact on how our memory systems work, and indeed musicians exhibit enhanced memory functions. Creating, storing and retrieving memories more quickly and efficiently. Studies have found that musicians appear to use their highly connected brains to give each memory multiple tags, such as a conceptual tag, an emotional tag, an audio tag and a contextual tag. Like a good internet search engine. So how do we know that all these benefits are unique to music, as opposed to say, sports or painting? Or could it be that people go into music were already smarter to begin with? Neuroscientists have explored these issues, but so far they have found that the artistic and aesthetic aspects of learning to play a musical instrument are different from any other activity studied, including other arts. And several randomised studies of participants, who showed the same levels of cognitive function and neural processing at the start, found that those who were exposed to a period of music learning showed enhancement in multiple brain areas, compared to the others. This recent research about the mental benefits of playing music, has advanced our understanding of mental function, revealing the inner rhythms and complex interplay that make up the amazing orchestra of our brain. Additional Resources for you to Explore Research into the nature of how the corpus callosum impacts on the brains functions, and how learning a musical instrument impacts on this, is ongoing. Recently, neuroscientists have dug deeper and found that changes in the corpus callosum may be dependent on the type of musical training a musician does and could be localized to the anterior corpus callosum. This area has shown an increase in bi-manual coordination (where the brain coordinates simultaneous multiple movements like using a knife and fork). Here is some of the latest research. Sometimes it is hard to explain all of this research to someone else so here is a short video you can share with others, about how music education can enhance brain development. I knew this stuff already. My memory capacity has increased since playing the ukulele, and my fine motor skills have become better. I certainly feel less dyspraxic when playing the ukulele. Does this appeal to you? What better time to book those ukulele lessons? I find it easiest to play Bb by twisting my index finger towards the headstock. You need the index finger to press down on both the E and the A strings in the first fret, whilst your middle finger is on its tip on the C string in the second fret and the ring finger is on the G string in the third fret. I find this tricky to do if all your fingers go straight on, as when you put the second and third fingers down, the index lifts up. See the video at the bottom to help.